Motorists in St. John's can use PayByPhone's mobile app to pay at 136 parking spaces on Harbour Drive. In addition to providing a simple, cashless way to complete payments, PayByPhone offers several features. The app sends text message reminders prior to your time expiring and allows you to extend a parking session remotely. For visitors to St. John’s, PayByPhone works immediately once downloaded without the need to register for an account. For those who do not want to download the app, the toll-free number to call is 1-866-234-7275. 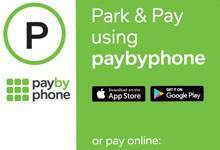 For more information you can download the app or visit https://www.paybyphone.com/.